Master servers were shut down. Playing multiplayer is now only possible using GOG.com version, GameRanger or Novaworld.cc. Bundled with Team Sabre expansion, allows for playing multiplayer. 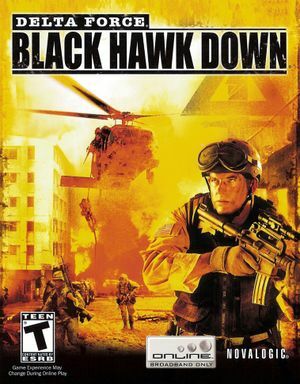 Delta Force - Black Hawk Down - General Update updates the game to the latest version. Team Sabre already includes this patch. Launch the game with /w parameter. Resolution of 640x480 and Windowed mode can make the game unplayable. Can be forced via graphics control panel (Nvidia). Setting might be disabled (force in the graphics card control panel). The game natively supports only 4:3 resolutions. It's possible to get the game running in widescreen mode by editing bytes directly in exe file. Launch the game and let it test your display. Save changes and run uniws.exe. Go to the installation folder or use the Find it for me... button. Type in your desired resolution and click Patch. Launch the game and choose 1024x768 resolution. This hack works with both base game as well as expansion pack. 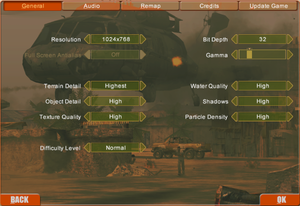 Menus, FMVs and most of HUD elements are stretched. Only 2 out of 3 messages fit the chat space after applying the hack. Might not work with the Steam version of the game. For co-op use Anaconda's Server Manager. Only possible using GOG.com version or GameRanger, because of NovaLogic shutting down their database. Run the game with the /serveonly parameter. In 2008, Novalogic updated their website. Sadly however, this caused few minor glitches on DFBHD websites that in-game browser is using. Go to Lost Your Password. Enter email address of your Novaworld account. On some configurations, option for full screen anti-aliasing is disabled. There isn't a known fix for it. Only alternative is forcing different AA settings from graphics card control panel. ↑ 2.0 2.1 File/folder structure within this directory reflects the path(s) listed for Windows and/or Steam game data (use Wine regedit to access Windows registry paths). Games with Steam Cloud support may store data in ~/.steam/steam/userdata/<user-id>/32670/ in addition to or instead of this directory. The app ID (32670) may differ in some cases. Treat backslashes as forward slashes. See the glossary page for details. This page was last edited on 30 March 2019, at 04:38.